The Shinhotaka Ropeway is in the far reaches of Takayama. About an hour and half drive away from the city center, the ride took us through and up the mountains. The snow-capped mountains we saw in the distance were now looming over us, and white blobs of snow can be found in the road side. If you want to experience snow without the heavy snowfall and double-digit sub zero temperatures, late Fall or early Spring would be a good time to go. In late November, we were lucky to experience a combination of the Fall foliage, and a liberal dusting of snow on the mountain. 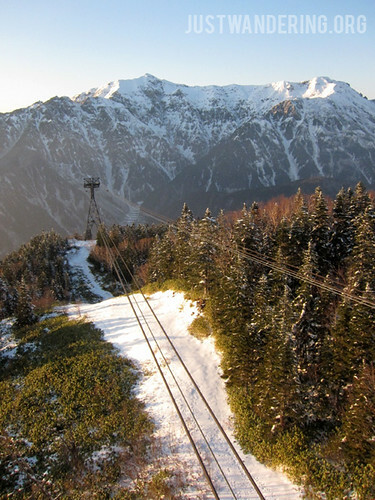 The Shinhotaka Ropeway consists of two cable cars. Visitors have the option to buy tickets for both ropeways, or just one, and also an option to buy a one-way or return ticket. Ticket prices start at ¥200 for adults and ¥100 for kids (one-way for No. 1 Ropeway), topping up at ¥2,800 for adults and ¥1,400 for kids (two-way for No. 1 and No. 2 Ropeways). The journey starts at the Shinhotakaonsen station, where the regular public bus terminates. After purchasing tickets for the ropeway, you proceed up to the second floor boarding station. The gondola for this leg is a single deck that can carry up to 45 passengers. There is very limited seating, though hand rails are available for standing passengers. It’s a quick 4-minute climb up the side of Mt. Nishihotakadake to the Nabedairakogen Station, the terminus of the No. 1 Ropeway. From there, you exit the building for a pleasant stroll to the Shirakabadaira Station to board the No. 2 Ropeway. This time you get to ride the double decker gondola, the first of its kind in Japan, which can accommodate up to 120 passengers (70 at the bottom, 50 at the top) and one conductor. The conductor gives a running commentary as you go up the mountain, sharing trivia and pointing out mountain peaks in the distance. Unfortunately, these are all in Japanese. 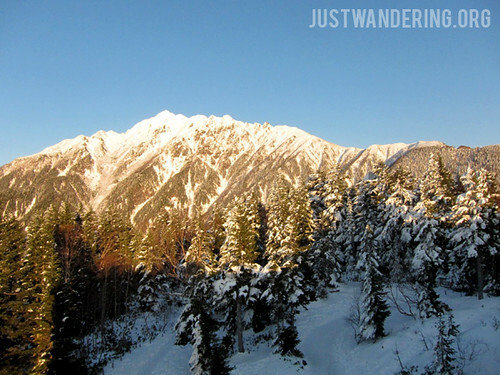 However, pictures of the mountains and labels are posted on the side of the gondolas, so you can just refer to those. The second cable car ride takes seven minutes and climbs about 800 meters to the Nishihotakaguchi Station. This 5-storey station features shops, cafes, and a roof deck that offers you 360° views of the Japanese alps. When there is enough snow, there would be a huge snowman to welcome you. There’s not much to do at the top, so after taking pictures, most visitors head back inside where it’s much warmer. Some line up to ride the ropeway going down, while some head out to the Sengokuenchi Nature Park for some hiking. Do note that the mountain climbing trail are for experienced climbers (the hikers we saw were all toting huge backpacks filled with gears). If warming up indoors isn’t for you, you can warm up at the Kamitakara-no-yu rotemburo, just off the Sangakukan Shinhotaka Visitor’s Center. If going au naturel in public makes you queasy, you can still experience the hot, sulphuric water by dipping your weary feet at the nearby ashiyu (foot bath). Just be sure you have something to dry your feet with afterwards. The Shinhotaka Ropeway is a good day trip from Takayama, either by bus or by car. If you’re driving, it’s a 70-minute drive to the Shinhotakaonsen station, plus a couple more minutes if you’re driving up to the Shirakabadaira Station. Nouhi Bus has regular trips from Takayama Station for ¥2,100 one-way and ¥4,200 round trip. You might want to check out their special ticket, where for ¥4,000, you get unlimited rides for 2 days between Takayama Station and Shinhotaka Ropeway. 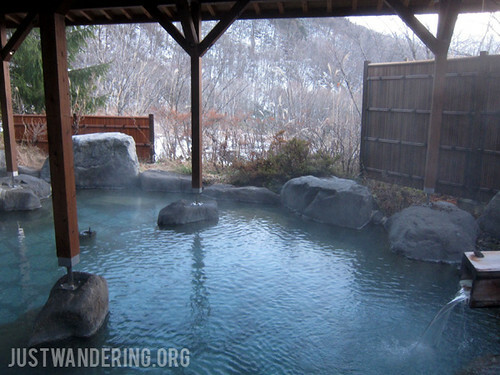 This is great if you plan on staying overnight and soak in the onsen. 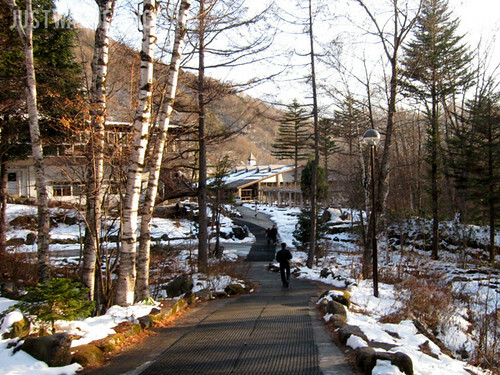 The group that operates the Shinhotaka Ropeway also operates a hotel just across the first station, a mere one minute walk. Hotel Hotaka feature both Japanese and Western style rooms, and outdoor and indoor baths. The lower station of the Shin-Hotaka Ropeway is connected by direct hourly buses to Hirayu Onsen (35-45 minutes, 870 yen one way) and Takayama Station (90 minutes, 2100 yen one way). Get off at the final stop, Shin-Hotaka Ropeway. Paid parking is available at both the ropeway’s lower station and at the Nabedaira Kogen Station, but buses serve only the lower station. hallo, can i know when (date & month) you visit this shinhotaka ropeway?? ?